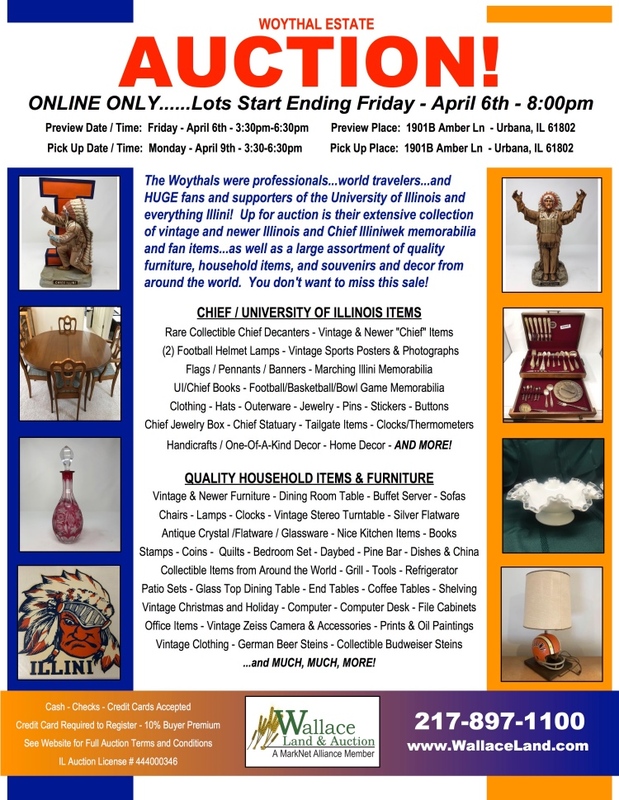 Illinois Chief Collectibles - Antiques - Furniture - Quality Household Items - Tools - and MORE! IF YOU HAVE NOT READ AND UNDERSTAND THESE TERMS – PLEASE DO NOT BID! Wallace Land & Auction has put forth every effort in preparing the catalog for this auction to provide accurate descriptions of all items. All lots are sold AS-IS, WHERE-IS, with all faults, imperfections and errors of description. Due diligence is the responsibility of the bidder/buyer, and it is the bidder’s responsibility to determine the exact condition of each item. Printed statements or descriptions by staff are provided in good faith and are matters of opinion. Bidders are encouraged to attend the scheduled inspection(s). B. AUCTION END TIMES: Wallace Land & Auction, LLC online only auctions are timed events and all bidding will close at specified time. However, our auctions also have what is called an “Auto Extend” feature. Any bid placed within the final 5 minutes of an auction results in the auction automatically extending 5 additional minutes. The bidding will extend in 5 minute increments from the time the last bid is placed until there are no more bids, and the lot sits idle for 5 minutes. Therefore, the auction will not close until all bidding parties are satisfied. This ensures no one can be outbid in the last seconds without having another opportunity to bid again. A. PAYMENTS: We accept cash, checks, Visa, MasterCard, American Express and Discover cards. A 5% convenience fee is applied to all credit/debit purchases. There is no convenience fee if your purchase is made with cash or check. Any transaction necessary to collect insufficient funds will have a $25 fee imposed. If you are a successful bidder, you will receive following the close of the auction an emailed invoice detailing your purchase. You will then either pay when you pick up your items at the scheduled pickup day/time…. or you may choose to have them shipped (see SHIPPING below). After the pick-up date(s), if your item has not been picked up and you have not contacted us to make shipping arrangements, your credit/debit card on file will be charged for the amount of your purchases plus buyer’s premiums and convenience fee. In this instance if your card is declined a $25 fee will be imposed. B. SHIPPING: The auction company, through the local United Parcel Service Store, can facilitate the packing and shipping of your items. The UPS Store can pack and ship items of any size, including furniture. PLEASE NOTE THAT THE UPS STORE PACKAGES ITEMS ACCORDING TO RIGOROUS SHIPPING SPECIFICATIONS, AND THUS SHIPPING CHARGES CAN BE SUBSTANTIAL. PACKING, SHIPPING, AND INSURANCE (IF DESIRED) COSTS ARE THE RESPONSIBILITY OF THE BUYER AND WILL BE PAID DIRECTLY TO THE UPS STORE. PLEASE CONTACT THE BELOW UPS STORE BELOW FOR SHIPPING QUOTES. If you wish to have your items shipped to you instead of picking them up, you must notify Wallace Land & Auction at shipping@wallaceland.com within 24 hours of receipt of your invoice. Wallace Land & Auction charges a $5 per lot handling fee to pull your purchases and transport them to the UPS store. You will be notified when your items have been delivered to the UPS store, and you can then contact them to finalize and pay for your items to be shipped. A. DEFAULT OF BUYER: Successful bidder not paying for items within 3 days of the date of the auction will be considered in default. Such default by the Successful Bidder will result in that Bidder’s liability to both the Seller and Wallace Land & Auction, LLC. Seller shall have the right to (a) declare this contractual agreement cancelled and recover full damage for its breach, (b) elect to affirm this contractual agreement and enforce its specific performance or (c) resell the items either publicly or privately with Wallace Land & Auction, LLC and in such an event, the Buyer shall be liable for payment of any deficiency realized from the second sale plus all costs, including, but not limited to the holding/transporting/storage costs of the items, the expenses of both sales, legal and incidental damages of both the Seller and Wallace Land & Auction, LLC. In addition, Wallace Land & Auction, LLC also reserves the right to recover any damages separately from the breach of the Buyer. The purchaser agrees to pay all reasonable attorney fees and costs incurred by Wallace Land & Auction, LLC in the collection of funds. The purchaser also agrees that a storage/handling fee of 2% per month be added to the balance of any unpaid balance due Wallace Land & Auction, LLC and any other costs or losses incurred by the Buyer’s failure to adhere to these terms. Any debt collection or dispute proceedings will be litigated or arbitrated in Champaign County, Illinois at the option of both the Seller and Wallace Land & Auction, LLC. 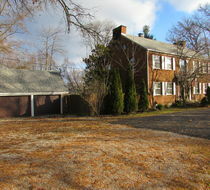 Both the Successful Bidder and Seller shall indemnify Wallace Land & Auction, LLC and hold Wallace Land & Auction, LLC harmless from any costs, losses, liabilities, or expenses, including attorney fees resulting from Wallace Land & Auction, LLC being named as a party to any legal action resulting from either Bidders or Seller.